Managing risk one customer at a time. It’s just good business to know your customers. In the days of identity theft and with the regulatory updates to the Fair and Accurate Credit Transaction Act (FACTA) of 2003 (also known as Red Flag Rules), an identity theft prevention program is critical to the success of your company and your relationships with customers. 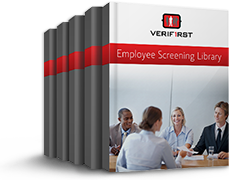 Depending on your industry and company’s tolerance for risk, VeriFirst can instantly provide you with the information you need to remain compliant with Red Flag Rule screenings. With recent updates to FACTA, your company may even be required to institute a full-cycle identity theft prevention program. A manual review of potential 'hits' on a criminal record database search. Our trained and FCRA certified staff will review and update records prior to release, helping ensure accuracy, and reduce the risk of false-positive matches to your Applicant. Instantaneous verification of identity, including: full name, social security number, date of birth, known aliases, and prior address history. A comprehensive search of individuals associated with the same SSN is also performed to prevent fraud. The Office of Foreign Assets Control (OFAC) of the US Department of the Treasury administers and enforces economic and trade sanctions based on US foreign policy and national security goals against targeted foreign countries and regimes, terrorists, international narcotics traffickers, those engaged in activities related to the proliferation of weapons of mass destruction, and other threats to the national security, foreign policy or economy of the United States. OFAC acts under Presidential national emergency powers, as well as authority granted by specific legislation, to impose controls on transactions and freeze assets under US jurisdiction. Many of the sanctions are based on United Nations and other international mandates, are multilateral in scope, and involve close cooperation with allied governments. Based on regulatory requirements and / or your tolerance for risk, establish the frequency for re-verifying your customer base against the OFAC SDN list. 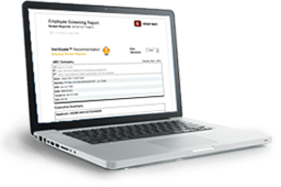 Download a Free Report and Activation Code. 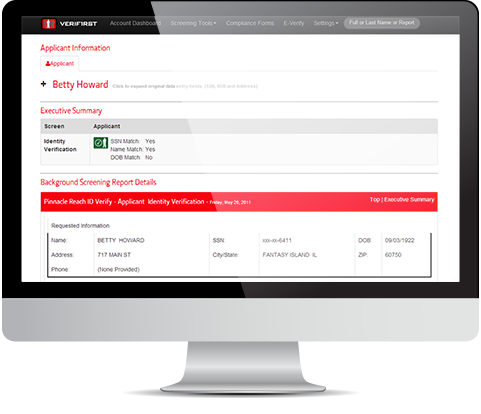 VeriFirst will monitor your weekly screening activity and send you a mobile-friendly alert based on the risk tolerances that your company has defined. If adjustments are required to improve your Pass/Fail criteria, you'll be able to do so quickly. Leverage additional risk management services including Consumer and Commercial Debt Collection. Learn more about our sister companies, Enterprise Recovery and BYL Collections. Our VeriGuide Decision Assistant can help you make your decision quickly with an at-a-glance look at whether or not an applicant meets your requirements.